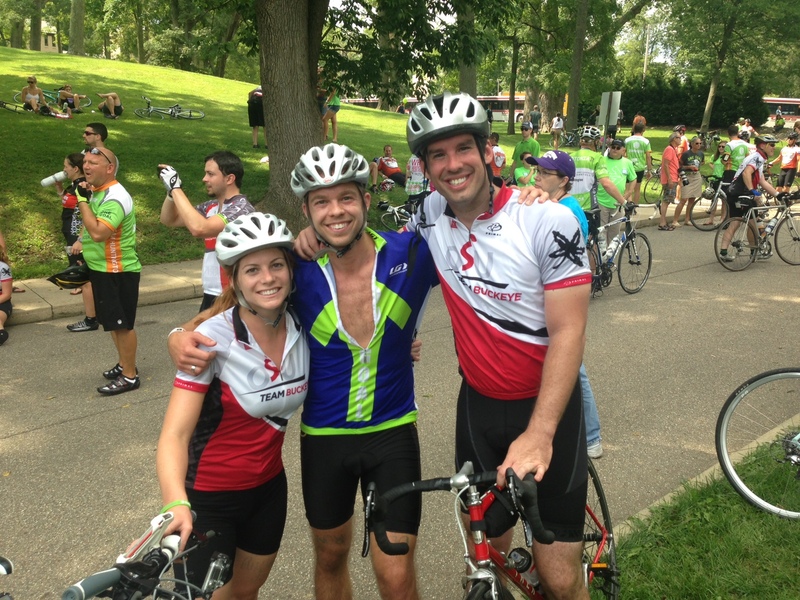 Once again, the folks who organize Pelotonia never cease to amaze me. 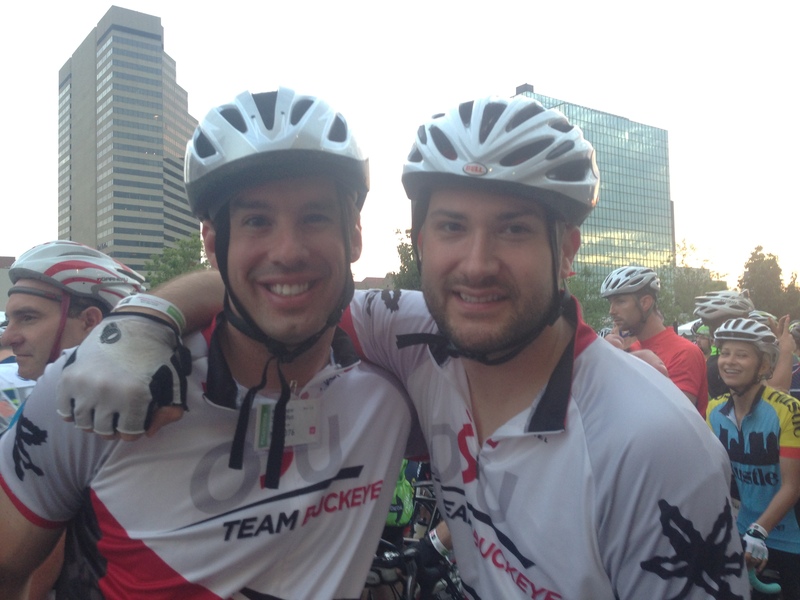 Over 6,700 riders and thousands of volunteers made this awesome event possible. And it’s incredible how smooth the event runs year after year. Friday night was the opening ceremony at Columbus Commons. The highlight of my night was meeting Chris Spielman for the first time. Chris lost his wife Stephanie to cancer and I was grateful to get the opportunity to finally thank him for writing is book: “That’s Why I’m Here: The Chris and Stephanie Spielman Story” If anyone has lost a loved one to cancer this is a must read. Stephanie Spielman shared the positive attitude and outlook on life that my mom did when they both battled their respective cancers. 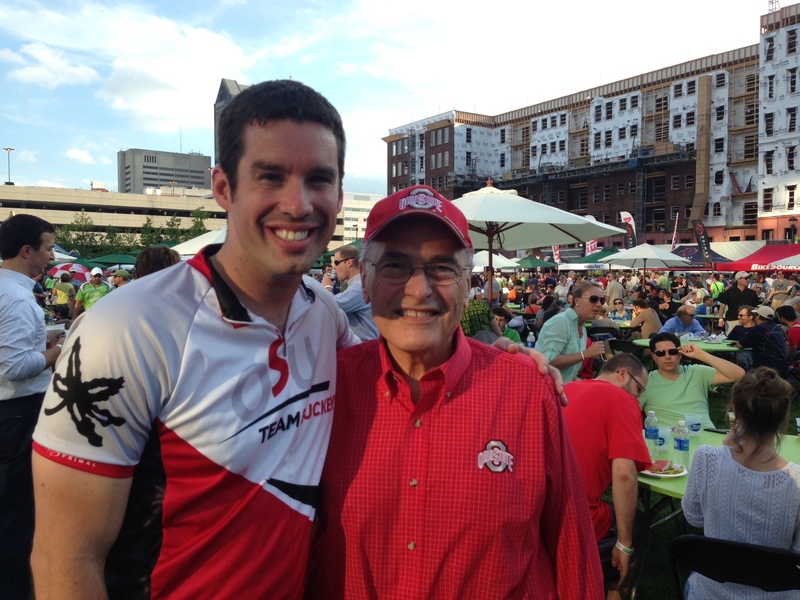 It was also great to see interim president Joe Alutto out and about and it’s awesome he’s an avid supporter of Pelotonia. He didn’t ride this year, but I’m sure he’ll participate when he retires (whenever that might be). 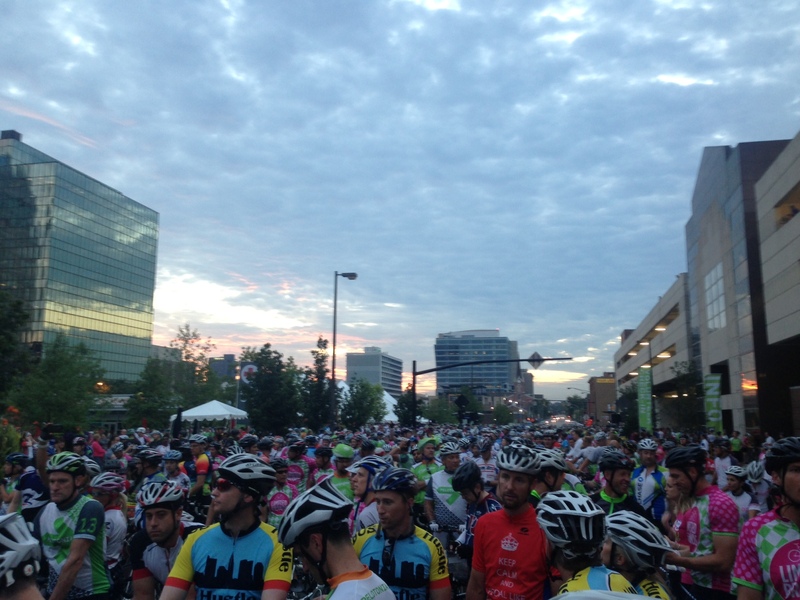 I’m not a morning person, so very few things will get me out of bed at 5:30 am on a Saturday, but Pelotonia is certainly one of them. We loaded up the Jeep with the guys from the house and arrived downtown to what was an amazing day. I was just about ready to hit the road and as I was pedaling out of the chute my chain came off the bike. Thankfully it didn’t break and I was able to get back on the road fairly quickly. I lost my riding partner Patrick Klein and never caught up with him the rest of the day. At the second rest stop I bumped into Mark Rudolph and Michael Lause and I was able to keep up with them for quite a bit and it was great to have a conversation with them. Rudolph did research over in Germany this summer and Lause did research here at OSU. One thing Lause does that I would like to start doing is that he tutors cancer patients. Mom always said I would be good going into hospitals and dealing with children who had cancer and the opportunity to help them keep up with their education in math and science would be great. The absolute best part of the ride was the 40-60 mile route right after lunch. The three of us flew through that part, but the 60-80 mile portion of the route was brutal. This is where I started to hit the wall. Rudolph and Lause took off and I couldn’t keep up with them. I late found out that they took the more hilly Reynolds Road route instead of the “flatter” Bennington Chapel route, which was the one I took. At the 80 mile rest stop I bumped into Brian Myers and Karl Koon and was happy to finish out Pelotonia surrounded by friends from Team Buckeye. The volunteers and supporters along the route were once again amazing. At every turn and rest stop they were there to lend a helping hand and offer encouragement, but the most inspirational part of the ride was around mile 82. A man was holding a sign on the right side of the road, standing next to his pick-up truck that read: “Thank you for saving my wife’s life.” It was a simple sign, written with a Sharpie on a white poster board, but man, that message was powerful. 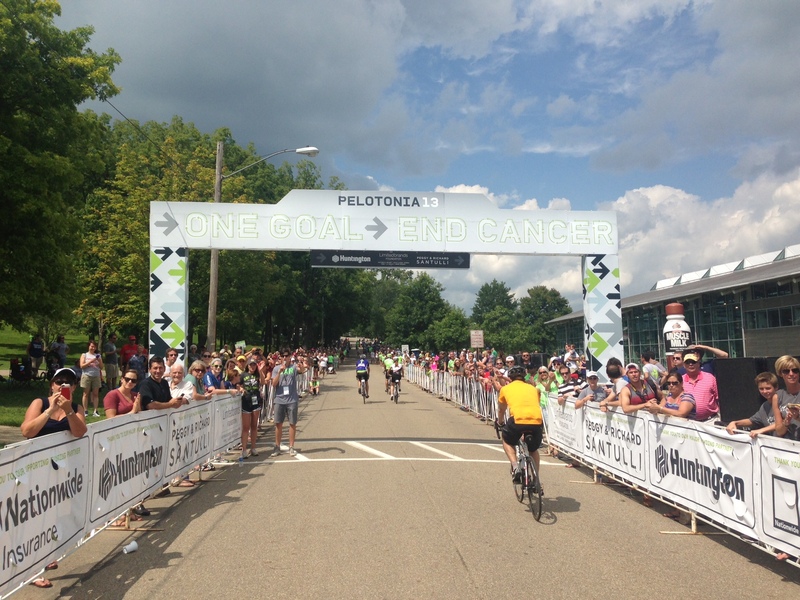 As I teared up riding along the next few miles there was no doubt I was going to make the century mark and cross the finish line. It’s amazing the things you’ll do for a loved one. I never thought I would ever ride 100 miles on a bike and I’ve done it three years in a row. But it’s not just for our loved ones, it’s for the wife of the man on the side of the rode thanking us for saving her life. It’s the funds we can use for research and to lure better doctors to the James. We’ve raised almost 54 million dollars over the last five years (and counting), yet there is still much more work to be done. It was great to brainstorm at the celebration event with Team Buckeye Co-Captain Craig Krenzel and also to chat with former television anchor Andrea Cambern. Andrea was filming participants all weekend long and we can use that footage to put a multi-touch book together using the iBooks author platform. 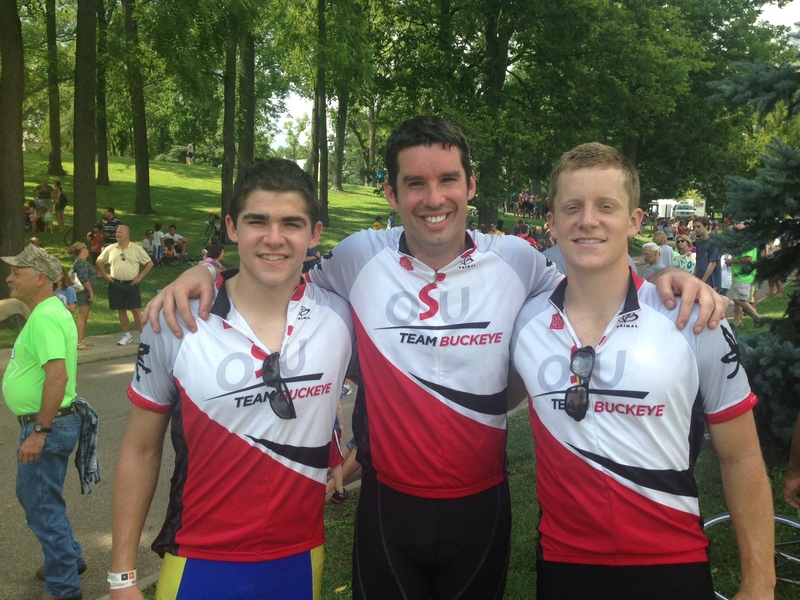 This can help us reach a national audience, as it would be great for Team Buckeye to tap into the alumni associations all over the country to help us match funds in the same way the super pelotons of Limited Brand and Huntington do. We have a long road ahead to see the vision of the opening video come to fruition, but we have an incredible amount of supporters ready to fight for the cause and I will fight with everything that I have until we find a cure.